24-inch mini bolt cutters are perfect for cutting small screws, nails and wire, garden, garage, workshop or on the job site. Compact and sturdy, their compound cutting action makes it easy to cut most soft and medium metals.All-in-all the 24-inch mini bolt cutters are the perfect tool set for any home owner.24-inch mini bolt cutters are perfect for cutting small screws, nails and wire, garden, garage, workshop or on the job site. Compact and sturdy, their compound cutting action makes it easy to cut most soft and medium metals.All-in-all the 24-inch mini bolt cutters are the perfect tool set for any home owner. The choice of chrome vanadium material, lever ratio and cutting edge angle make the KNIPEX Cobolt Lever Action Compact Bolt Cutter a powerhouse of a tool. Its redesigned lever action mechanism guarantees an extremely favourable lever ratio with low friction, while the cutting performance is 20 times higher than the hand force applied, requiring 60% less effort to operate. Based in Germany, KNIPEX tools are German-engineered to produce exceptional features, comfort, design and performance. Pro Series 18-inch Bolt Cutters with Slip-Proof Rubber Grips The centre-cut jaws of these 18-inch, professional quality bolt cutters are designed to chop through soft to medium-hard metals up to 5/6-inch thick. The heat-treated chrome-molybdenum jaws are engineered for long life, and lock plates prevent them from loosening with use. 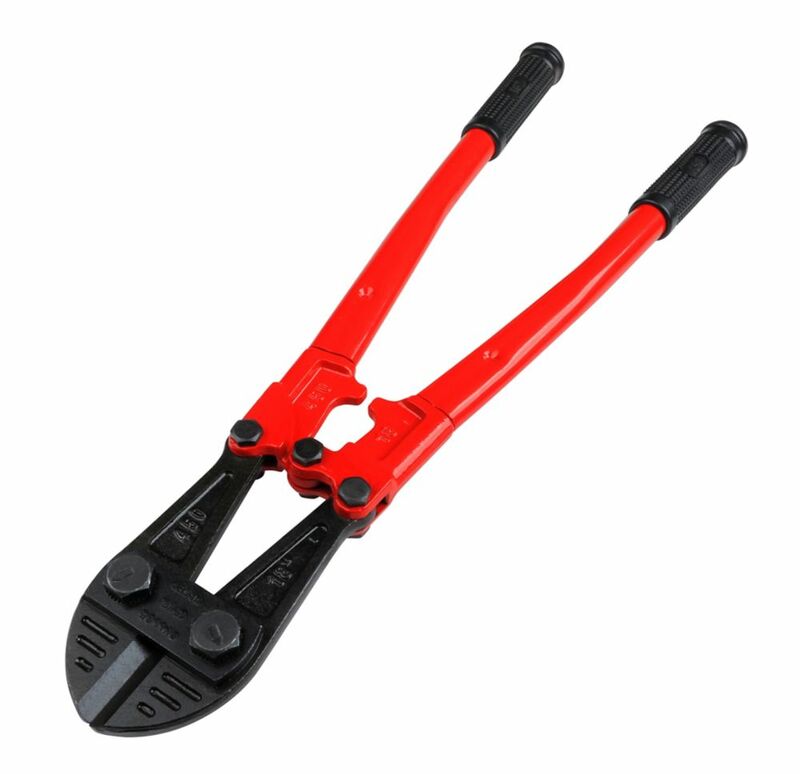 Featuring an adjustment screw for setting the position of the jaws when closed, and all-steel tubular handles with slip-proof rubber grips for comfort and security, these 18-inch pro bolt cutters fit easily into a toolbox or on a tool belt.